This is me, wearing my editor face! Well, my Halloween editor face. 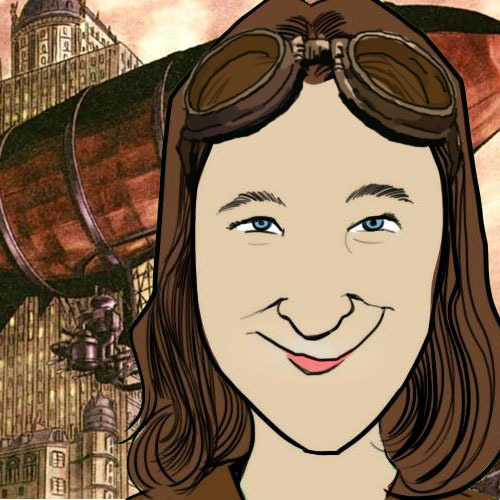 All editors need goggles and a getaway blimp! And would-be writers! And once-were writers! Consider this an official invitation to check out yeah write’s November writing competition! Starting November 2, submit your best personal essays, mostly-true stories, flash fiction, poetry or microstories to the appropriate weekly challenge. We’ll give you a prompt on Sunday, which is mandatory for the gargleblaster microstory challenge but optional for the nonfiction and fiction/poetry challenges. On December 7 we’ll announce the 1st, 2nd and 3rd prize winners, chosen from across the grids! What can you win? Well, cash for one thing. $200, to be precise. Books, for another. Chocolate for a third. Plus, bragging rights, and who doesn’t love those? Even better: refer a friend to the challenge, and if your friend wins, so do you! Spread the word and join the fun. It’s going to be a grand old time. The competitiin runs for four weeks (with a non-competition week tucked in there for the US Thanksgiving holiday. The last competition week starts Nov. 30, with the nonfiction grid opening on Dec. 1, fiction Dec. 2, microstories Dec. 3, voting Dec. 4, and winners announced on the 7th! Ooo, i forgot to say: goid luck on NaNoWriMo! I’ve done it twice and loved every minute of it. Slight clarification: the winner of the contest will be the writer who accumulates the most points over the four weeks. So the more you submit, the more chances you have to rack up points. But remember this: if you refer a new writer to the contest, and that writer wins, you – as the one who referred him/her – will also win that prize. So even if you can’t play all month, spread the word to your friends and make sure they mention that you referred them!